It is inevitable. After every extreme weather event the question: “Was it caused by climate change?” is never far behind. Not only that, but often the question is asked with the implication that there is a desire for a simple yes or no answer. But reality is more complex than this and requires a more detailed answer. So what can we say about Typhoon Haiyan? First Haiyan was the strongest tropical cyclone on record to make land fall with sustained winds of 315 km/h (195mph) and gusts up to 378 km/h (235mph). This was no ordinary Typhoon; wind speeds that high are more commonly associated with tornadoes, not massive storms that are hundreds of miles wide. Having been in a F3 Tornado 13 years ago with wind gusts up to 300 km/h (186mph), I have some idea of what devastation such wind speeds can cause. Of course during the tornado, the damage was contained to a small swath, the winds were only blowing for a short period of time further limiting the damage, and most importantly there was no storm surge. People in the Philippines facing Typhoon Haiyan were not so lucky. The winds lasted for hours, the swath of devastation was enormous and the storm brought with it a massively destructive storm surge that was over 5 meters high in places. The storm surge came like a tsunami and left devastation that is beyond words. But what about climate change? How did it affect the storm? Well, we know for a fact that Hurricanes feed off warm ocean temperatures. We also know for a fact that our GHG emissions have resulted in large amounts of heat being stored in the ocean. We also know that while the ocean surface wasn’t anomalously warm (it was still about 30°C which is fairly normal for that part of the planet) , the water up to at least 100 meters bellow the surface was 4 – 5°C (7 – 9°F) warmer than average. This means that Haiyan had warm water extending at least 100 meters deep to use as fuel; this was a major factor that increased the intensity of the hurricane. 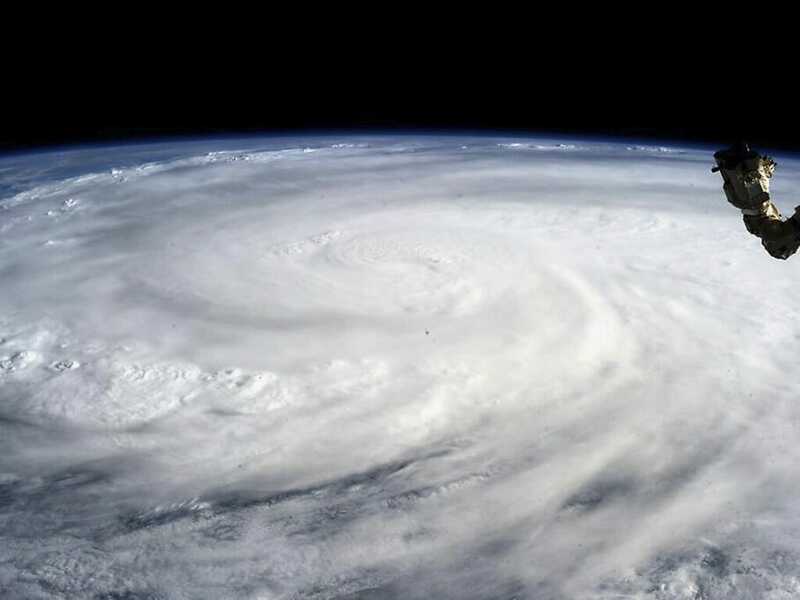 They found that in the strongest cyclones, the maximum wind speeds have risen by about 29 kilometers per hour (18 mph) over the period of 1981 – 2006, a substantial amount. They found this was true of cyclones that occur nearly all over the world, and they found that this trend of increasing maximum wind speed is correlated with surface sea temperatures. They also found that an increase of 1° C in surface sea temperatures corresponds to an increase in the number of strong cyclones by as much as 30 percent per year. Note that it doesn’t increase the total number of cyclones; it only makes the strongest ones stronger. All of this makes it pretty clear that climate change at least played a factor in increasing Haiyan’s intensity. Well, maybe. The phrase, oft-repeated after extreme weather events “no single weather event can be attributed to climate change” applies to Haiyan as it does to any extreme weather. Large storms and abnormally warm patches of ocean can happen even without anthropogenic climate change. But ultimately this isn’t a helpful way to look at the situation. It doesn’t matter if typhoon Haiyan was caused or intensified by climate change. There is very good evidence to support the conclusion that continued unmitigated climate change will lead to more intense tropical cyclones, and there is even some evidence (see the Nature paper above) that on average cyclones are already getting stronger and more devastating. So perhaps Haiyan was intensified by our continued GHG emissions, or perhaps it wasn’t and the storm and destruction would have happened anyway, but one thing is clear: every year we continue emitting GHG into the atmosphere we increase the odds of creating extreme weather like Haiyan. 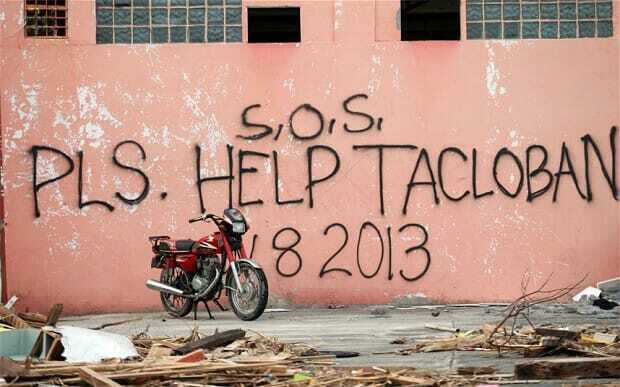 Importantly the devastation in the Philippines poses a very important question that often gets overlooked. How do you adapt to storms like Haiyan? There are many things that can and should be done to minimize the damage and loss of life, but neither loss of life or damage to property and infrastructure can be eliminated. As Jim Prall mentioned on Twitter “This is an impact you ‘adapt’ to with body bags.”. Unfortunately this is the best we can do; this is the reality of adaptation. So given that we know that our current emissions path will lead to more, and has likely already caused a fair amount of, destructive extreme weather, and given the fact that Haiyan clearly demonstrates that adaptation is not going to be enough, we need to actively work towards changing direction and reducing drastically, then altogether eliminating, our GHG emissions. World leaders are currently meeting in Warsaw, Poland to continue the United Nations Framework Convention on Climate Change (UNFCCC) process and negotiate towards a global agreement to reduce emissions. Past negotiations haven’t lead to a comprehensive agreement to reduce our emissions, rather they have agreed in principle that emissions should be reduced at some point in the future and then kicked the can to the following year’s meeting. This has, depressingly, happened at every UNFCCC meeting since at least the Copenhagen meeting 5 years ago in 2009. Real progress has been non-existent. Perhaps the devastation caused by Haiyan and the emotional plea by the Philippines’ Delegate Yeb Sano can spurn world leaders to finally go beyond agreeing in principle and start tackling the problem and making real progress towards a solution. The can has been kicked far enough. The hurricane/typhoon forecasts currently predict pretty well the future track of the storms for some 3 days ahead. Why not include the estimated categories of the damage to the track forecasts? This might be useful for people on the outer skirts of the landfall. Just looking at the wind speeds, like I did on the link, isn’t enough for the variable size of the tropical cyclones. To err towards caution, the forecasts should state something like:”Category 5/6 damage possible on area from __ to __”, taking note of the possible gusts, too. To me, Haiyan was about the 12th Cat6 storm in the record. And if some engineers claim they can’t build structures that can withstand a low end Category 5, get the hell out of these, if one’s coming. Um, these are indeed part of the forecasts. Though they refuse to give us a category 6. There are various excuses for this, but I think the main reason is that Al Gore once suggested it and there are people who don’t want to give him the satisfaction. oh, the gore of it. however tweaking the scale, highest low limit I can get for category 6 is ~190mph for 1 minute sustained winds this would drop Camille to borderline 5/6, and make Haiyan (chinese translation: ocean hole, how appropriate) the 1st landfalling 6(-). no way some americanos can prevent me to call it what it is. When J. Public is told ‘No single weather event can be attributed…’ in answer to the inevitable question, what he/she hears is ‘No’. Perhaps the ‘standard’ answer should be ‘All extreme weather events have a significant probability of occurring more frequently because of AGW’, when instead he/she will hear ‘Yes’. It matters. Alas, that would be an overstatement. That is essentially Kevin Trenberth’s position. Jeff masters said on his website that the JMA (Japanese Meteorological Association, estimated the wind speeds of Hayian at landfall at 145mph. So did the Philippine Meteorological Association. Since they measure sustained winds for 10 min., not for 1 min. like us, you multiply by 1.14 (per Jeff Masters) to get 165mph. That would put Hayian at number 11 on your list. Is there a reason that the estimates of the wind speed vary so much. The Philippine Met. actually measured the wind speed with an anemometer wouldn’t that count more than an estimate. Or was that far from the point of highest wind speed? 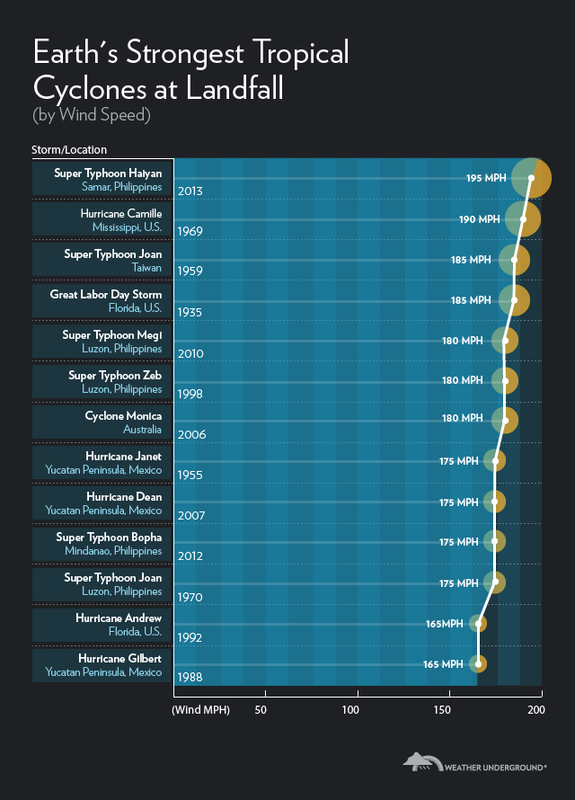 The list comes from Jeff Masters and involves his best estimation of wind speed for Haiyan.